Posted February 23, 2015, in Faculty News, Featured News, News, We R Arts and Sciences Student Spotlight. Dr. Lauren Silver is no stranger to helping others. An Assistant Professor of Childhood Studies, Dr. Silver has successfully merged community outreach with academics. As evidence of her passion, she has received both the Rutgers–Camden Civic Engagement Faculty Fellowship and the Chancellor’s Award for Academic Civic Engagement. 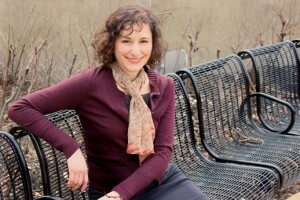 Although she did not immediately know which path to take, first dabbling in pre-medical and biology courses, Dr. Silver soon followed her passion and the rest fell into place; she earned her bachelor’s in anthropology at Washington University in St. Louis, then pursued her master’s degree, and later her Ph.D., at the University of Pennsylvania, in Education, Culture, and Society. She has published numerous articles focusing on the hardships of young urban mothers and children, and has served her community as a lead teacher at the Parent Infant Center, and as a Facilitator for Youth United for Change and Research for Action, all of which are located in Philadelphia. Although Dr. Silver has many prestigious accomplishments, she remains down-to-earth and grateful for the opportunities to help others. “When I first arrived at Rutgers, I couldn’t believe my fortune. This is my dream job. When I first came here, I felt at home.” Dr. Silver adds that she also likes to be “responsible and involved” while researching the communities of the Philadelphia and Camden areas to which she is personally and professionally connected. When she first graduated with her bachelor’s degree, she admits she didn’t know what to do with her degree, saying “I never even thought of being a professor until much later.” She wanted to use the tools she acquired from her degree, but she wanted to branch out from full-time social work. “I started to understand myself better. I knew I couldn’t do [social work] forever.” She describes how emotionally and mentally taxing her work in the field was. “I would be paged at 2 am because a girl got stabbed…it was so much trauma…but then those burdens led to research.” Although she did not plan on writing a book at the time, this experience would further fuel her research for System Kids, and help her realize her love of teaching and writing. Thirteen years of experience, practice, and research later, Dr. Silver’s new book came to fruition. System Kids: Adolescent Mothers and the Politics of Regulation, from UNC Press, has launched. It features young mothers and their children and the obstacles they face in the child welfare system. “If you put children at the center, it can change our view of policies and history,” Dr. Silver says. In her book, she highlights her experiences as well as the narratives of mothers in the system, and how important and necessary it is to understand and help them rise above their situation. Another project she is currently working on is a manuscript, titled Youth Pathways Across Camden: Narratives in Urban Schooling, featuring the ethnographic work done in Camden at MetEast High School. Thus, her manuscript will be a testimony to years of studying urban culture. She is particularly interested in researching the effects of learning in urban areas on children as they grow into adults. Her newest project, which she recently started, is called Integrated Ethnography, which is a joint venture with Jaskiran Dhillon, an assistant professor at The New School for Public Engagement, whom she met in graduate school. “This book will define what we do,” she says, explaining that the project will explore the integration of activism and advocacy with research in communities. This manuscript will blend and compare the two authors’ methodologies. Already, Dr. Silver has achieved many things—including earning a Digital Teaching Fellowship and being appointed as an affiliated scholar for the Center of Urban Research and Education—and yet has plans for many more projects and progressions. With all her hard work and compassion for others, Rutgers–Camden is honored to count her as one of its dedicated and high-reaching faculty. Page last updated by Faculty of Arts and Sciences at 10:43 am August 10, 2017 . This page was printed from http://fas.camden.rutgers.edu/2015/02/23/we-r-arts-and-sciences-dr-lauren-silver/ at 1:41 AM Monday, April 22, 2019.